cutting-edge, fully coupled 2D and 3D thermodynamic and thermomechanical numerical modelling of lithosphere and mantle deformation, fluid flow and surface processes. 1— Synergies/complementarities: ZIP will boost scientific achievements by bridging previous, independent investigations from all partners. 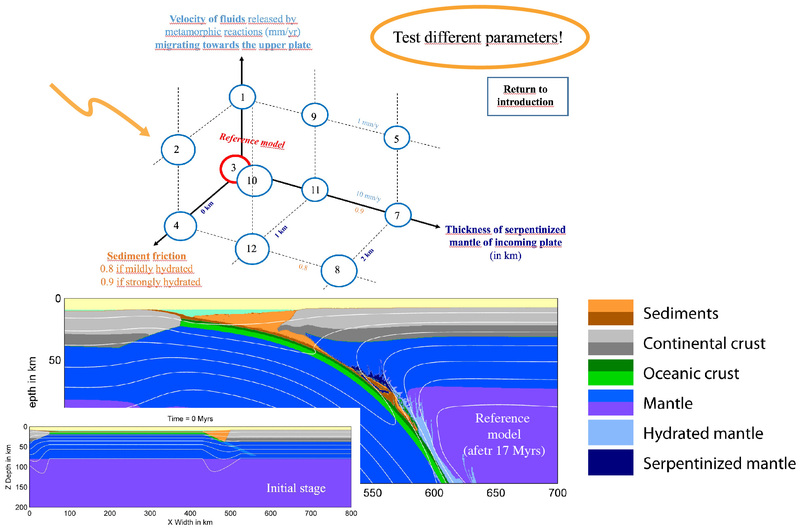 On both (1) active and (2) fossil subduction interfaces, observational and laboratory constraints on geological features from a wide variety of fields will drive (3) multi-scale, multi-physical numerical models designed to identify and test major parameters governing the feedback between fluids and rheology, and their associated geodetic and seismic signal. Model predictions will in turn be tested against geological (from the cm- to km-scale) and geophysical data (km to 102 km scale). 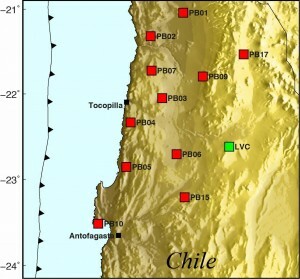 2— The use of cutting-edge tools and observations, which were simply not available a few years ago: (i) state-of-the-art seismic imaging methods using both active and passive seismic data to improve the resolution (e.g. detailed tomographic techniques with full wave inversion, receiver functions and noise analysis) and continuous monitoring through GPS, InSAR, and dedicated, permanent or mobile observatories (ii) high-precision analytical techniques, with high spatial resolution and low detection limits, and geochemical tracers tied to thermodynamic tools and databases for more accurate temperature-time‐depth determinations and estimates of fluid compositions and fluxes (iii) numerical modelling with high-resolution multi-physics codes taking into account thermodynamics, fluid migration, multiple rheologies and even enabling to reproduce seismicity. This is reflected in the choice of the private sector secondments (seismic imaging, analytical geochemistry and numerical modelling). 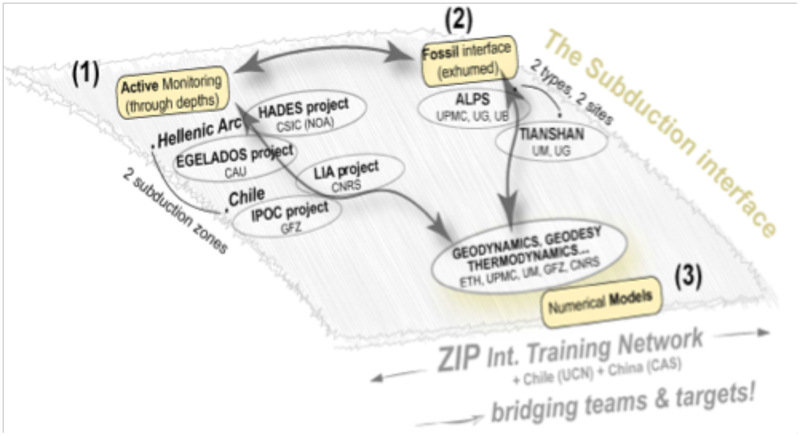 3— ZIP research backbone: provide a unique, innovative combination of joint and progressive research training to the fellows. With ZIP Starter 1 (M-8) the fellows will get the present-day picture of the plate interface of an active (Hellenic) subduction zone by analysing and interpreting signals from rocks and major structures at depth during a marine geophysical experiment. During ZIP Starter 2 (M-9) this picture will get clearer as the fellows will be able to tie these signals to the rocks and structures of an exhumed fossil plate interface in the Alps and compare it to the Hellenic present-day example. 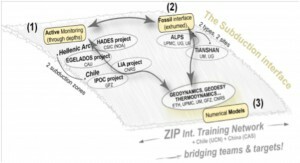 During ZIP consolidator (M-25), the fellows will have the unique opportunity to participate in a geodetic monitoring campaign of the (Chilean) subduction interface and get involved in data processing and interpretation. This original combination of high-end interdisciplinary research (WP1-3) and joint research training (WP4) will enable the fellows to effectively improve the resolution on the plate interface from a few kms down to a few hundred meters and to characterize and calibrate both the interface (nature, dimensions, properties, variability) and the interplay between the various physical and chemical processes from near surface down to 100 km depth. This combination will foster the emergence of new, supra-disciplinary fields.